Up until 8.45am, I didn't actually have a role at this event. I was of course in Central Park at 7am to set the course up with Adam and Richey, but after that things were a little sketchy. It was at the moment that two of our volunteers turned up that I found my calling for the day. The day's tail-runner came to the registration desk and notified us that she wasn't able to run, so I stepped in to take over. This worked out perfectly as it gave us an extra marshal. The extra marshal came in very useful on the bridge, as one of the wooden planks on the bridge has somehow bowed and is causing a little trip hazard. The council have been informed and are looking into it, but in the meantime we were able to place some warning cones over the affected area and give our extra marshal the sole role of warning runners about the hazard. So once Adam had finished his run briefing, I got to experience life at the other end of the field. It's sometimes easy to forget that for some people, 5k is a bloody long way to run and takes a huge effort to complete the course. It wasn't my first time as a tail-runner. 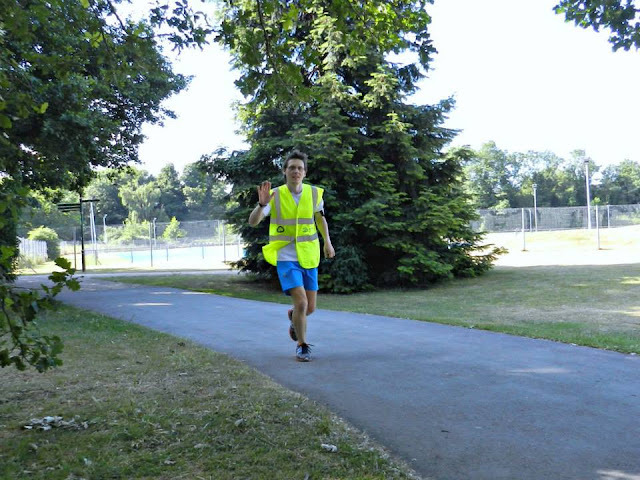 I have done this many times before as a run leader at So Let's Go Running and I also took on the role over at Harrow Lodge junior parkrun [blog here]. It was, however, my first time as an official tail runner at a 5k parkrun event. For any budding tail-runners, it is important to note that you may not actually be running the whole time. With parkrun being an inclusive event, we welcome all abilities. I found that there were a few occasions where I was stood completely still while the last runner took a breather, which I was of course more than happy to do - our little incline must feel like a mountain to someone that has never run before. Being tail-runner meant that I was in a good position to make the signage retrieval process a little easier, so I dropped back off of the last runner and grabbed all of the signs and cones as I passed them around the course before dropping them at the last corner with another of our core volunteers, Harley. 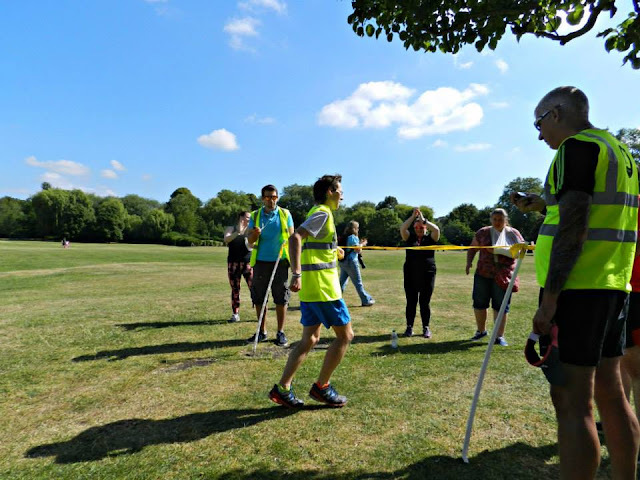 I saw the last runner safely over the finish line and in the process became the first person at Dartford parkrun to finish in both first and last positions (I think - correct me if I'm wrong). I was handed finishing token number 182, which was our second highest number of finishers with only the inaugural event attracting more participants to date [results page].